There are so many different products on offer for the sealing of Reservoirs it gets confusing. As a Company that specialize in reservoir sealing, we are able to add all sealing products to our product range, we don't. We believe in forming sustainable relationships with our clients with tried and tested products, not hit and run products. Here you will find a range of lining products that work. All linings use the existing structure for support, and acts as a solid waterproof barrier between the water and the structure. Painting different products to the wall and floors are a temporary solution. Any product applied directly to the walls and floor will eventually crack, and needs maintenance. PVC – Pre Manufactured to Reservoir size can be supplied as DIY kit. HDPE – Manufactured on site and installed by our team. 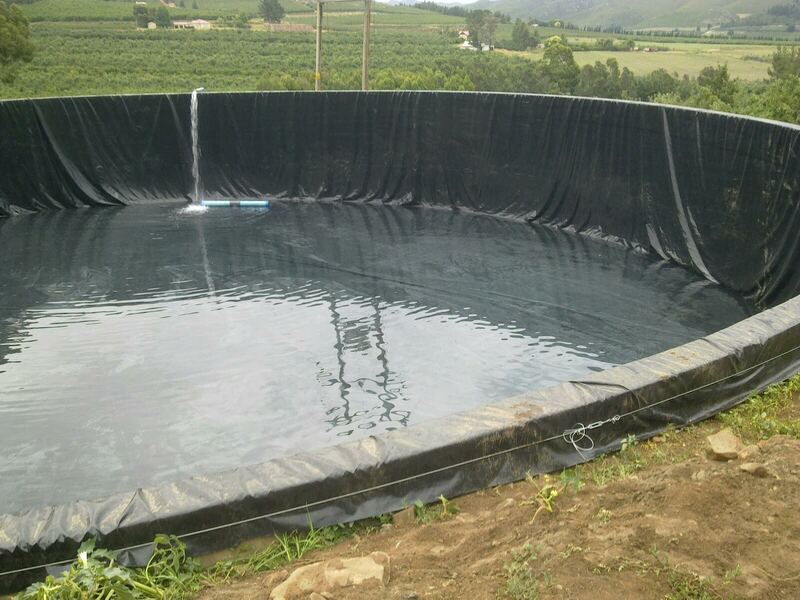 Vinyl - We only use Vinyl for our swimming pools, and Porta Pools, it is not suited for reservoirs. Vinyl is a unsupported material and needs to be full of water, were water levels in a reservoir various, the Vinyl will shrink and stand away from the walls and inventively start cracking. 1000 gram PVC Reservoir lining – Thickest PVC lining in South Africa. 600 gram PVC Reservoir lining – Our proven Standard PVC lining. Existing cement or brick reservoirs have tendency to leak, the main source of this leaking occurs through the reservoirs floor, with a lot of water disappearing. 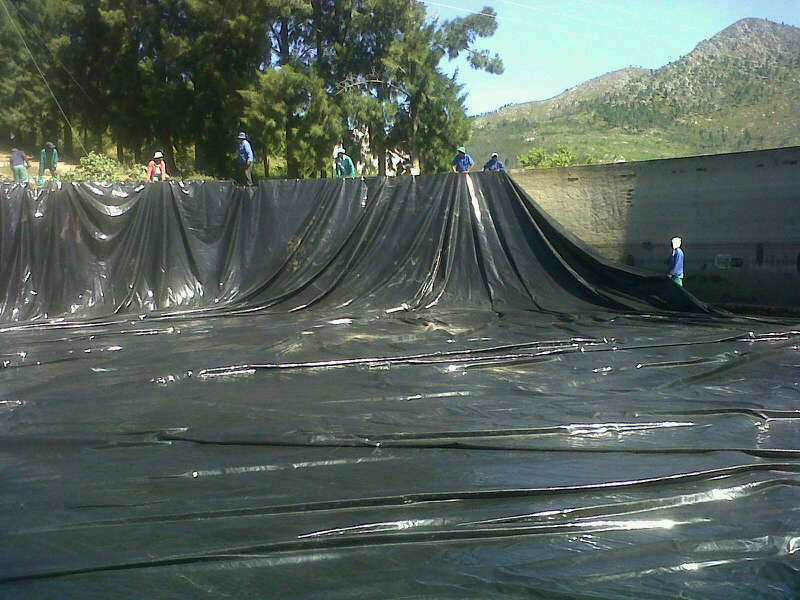 Our Reinforced PVC dam liners use your existing structure only to take shape thus forming a water tight barrier between the water and your reservoir in creating a leak free reservoir with water being used now for the intended purpose instead of disappearing into the ground. PVC Liners can be manufactured in different shapes, all PVC dam Linings are joined using a High Frequency welding process, resulting in a water tight joints. PVC Linings come in different thickness. Contact us for the right solution for you. 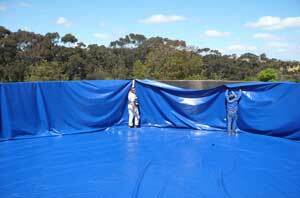 We use the 1.5mm HDPE liner for reservoir liners, it has very good resistance to many chemicals, and even solvents. HDPE has a very high resistance to harmful UV rays, and is designed and manufactured to withstand exposure to the sun. These liners are manufactured on site and installed. 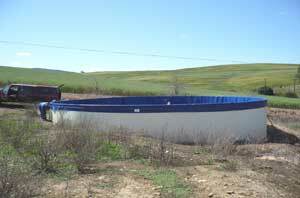 Suitable for earth dams as well.